Sally Hawkins turned in one of the best acting performances of the year and in our opinion deserves Oscar consideration. Ethan Hawke also was magnificent and deserves acclaim along with Director Eisling Walsh who put together this very touching movie written by Sherry White. The setting is a rural community in Nova Scotia, which looks like it is the 1930s but was probably more likely the 1980s. Hawkins plays Maudie, a handicapped young woman who has physical disabilities and has lived a difficult life. 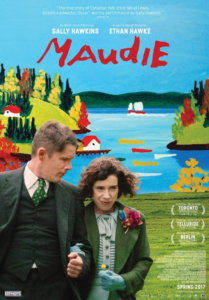 We meet her as her brother tells her that he has sold their deceased mother’s house and Maudie has to continue living with her aunt with whom she doesn’t seem to get along very well. While in a general store of a small community, she then sees a fisherman (Ethan Hawke) put an advertisement on a bulletin board looking for a woman to help him with chores like cleaning and making meals in his one–room cabin. She applies for the job, gets it when no one else applies and moves into his cabin. The remainder of the film is an examination of the relationship between these two people and the small community in which they live. Maudie is a natural artist and she begins to draw on the wall and windows of her cabin. She is discovered by a wealthy tourist from New York, who gives her work some visibility. She is ultimately the subject of a TV show, which popularizes her work and she becomes a somewhat known artist. She also ultimately wears her “employer” down and convinces him to marry her. There is no evidence that she achieves any kind of wealth from her work but she clearly derives great satisfaction from what she does and even grudging respect from her husband. In the film we only see the couple as poor people living in the small cabin.